J.D. Gross. A name that draws a lot of traffic to this site and one of the first chocolate makers I tried after discovering Origin Chocolate. Why? Because it is easily available in every Lidl store in the world and it is cheap! Produced by Rausch, a German chocolate company, this brand is sold all over the world and tickles the interest of many people around the globe, from India to Japan, from Europe to South-America according to the visitor statistics of my blog. 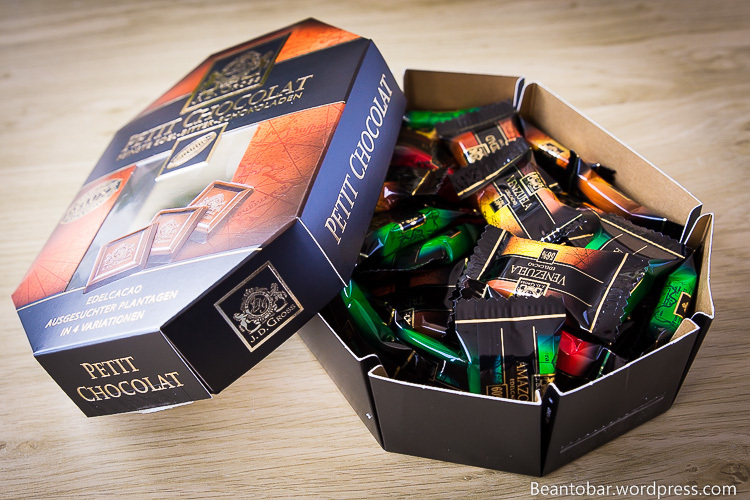 This box is a collection of 4 varieties – 4 different origins in different cacao percentages. It was given to me as a gift and provides me with the perfect opportunity to try four types in one go! As always, the box looks fancy, slightly overdone. It is covered by words like Deluxe, Exclusive and Edelcacao in gold letters. But taste doesn’t come from fancy print! Let’s find out if we can find some interesting notes! Venezuela – 56%: Aroma: rubbery, roasted – Taste: sweet, chocolate, slight nutty, almost reminding me of nougat near the end. Volatile aftertaste. Amazonas – 60% Aroma: the same rubbery smell and a slightly stronger aroma – Taste: Still sweet with a deep cacao taste, a bit fattier in taste. A faint reminder of vanilla and fudge. Ecuador – 70%: Aroma: Slightly spicy – Taste: stronger roasted taste, bit the cacao butter content becomes stronger too, more clingy on the palate. A rather bland taste with just at the end a bit of the spices coming through. Trinidad – 75%: A: Earthy, yet still a faint hint of rubber – Taste: a dry earthy start and next a lot of cacao butter to temper the bitterness. No taste evolution whatsoever. Rather boring really. It is clear, this chocolate doesn’t stand a chance next to the big guns in the Bean-To-Bar world. While it claims to offer 4 varieties from different regions, there really isn’t much taste going on, let alone vast differences. I can see how people might enjoy these chocolates over standard bulk chocolate, but it doesn’t thrill me the least bit. Try it if you are curious, it won’t cost you much, but know there is so much better out there! 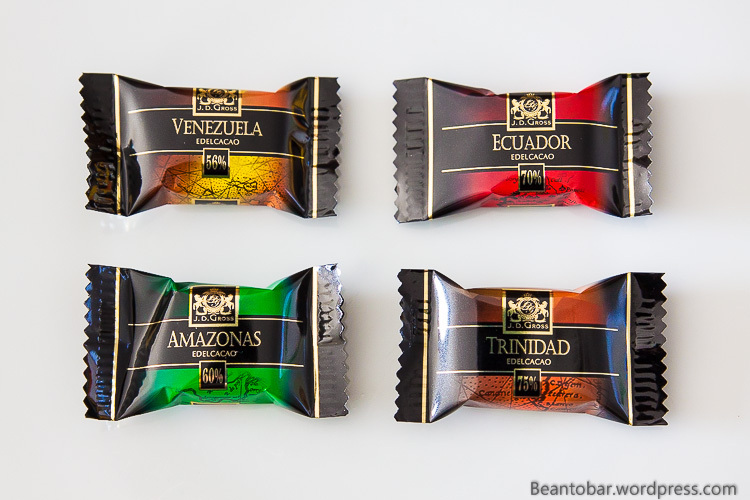 A sad conclusion, because more and more chocolate makers start to throw around origin bars. 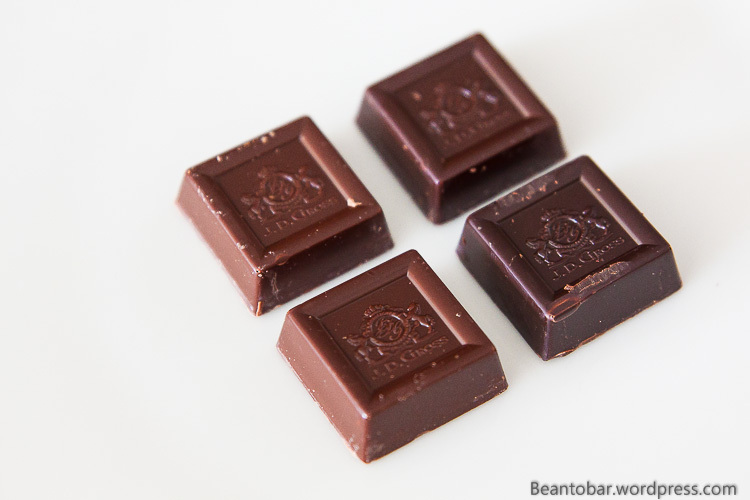 Bur Origin Chocolate doesn’t mean quality perse! It takes a lot more love and devotion to quality cacao to produce a true great origin bar. Fortunately for us chocolate enthusiasts, more and more inspired chocolate makers know how to put out a great product. Let us honor all these fine people! Super lekker maar niet meer te vinden!!! Waren deze alleen in de Lidl te koop? en waarom nu niet meer? 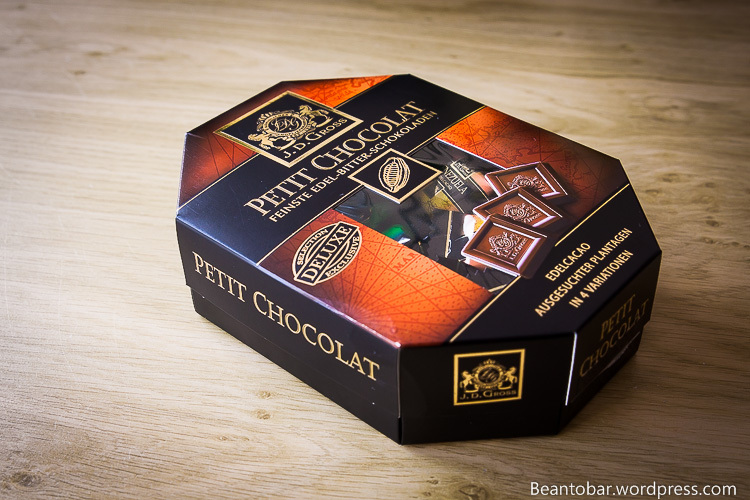 Door deze chocolaatjes ben ik ooit van Delhaize naar Lidl overgeschakeld en nu verkopen ze deze lekkere chocolaatjes niet meer, in de plaats is er echt slechte chocolade gekomen die in de verste verte niet te vergelijken is met J.D. GROSS PETIT CHOCOLAT! Tja, ik denk dat Lidl deze enkel in feestperiodes in de winkel heeft.